We've got you covered when it comes to stopping those annoying telemarketing calls that waste your time and distract from import things. We maintain a large database of known telemarketers numbers provided by the FCC and use this to filter incoming calls. There are 3 options for how to handle calls from known telemarketers and robocalls. Challenge - force the caller to Press 1 to continue and connect the call. This is similar to a web form CAPTCHA to prove they caller is a real person and not an automated system. Block - calls will be immediately ended with no option to connect the call. Allow - allow calls to come through as normal. 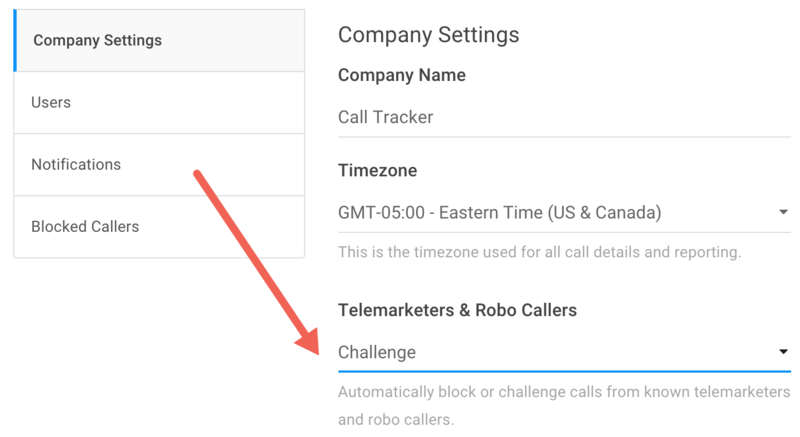 Note By default, you're all calls from known telemarketers or robocalls will be challenged. We recommend challenging calls over blocking, its better to allow a call to come through if it's human than get totally blocked. You can find the settings for Telemarketers & Robo Callers where you are able to choose how you'd like to handle the calls. Update the setting save your company settings below.